While everyone seems to lust over the far more boxy-looking Hakosuka, I’ve always had a rather soft spot for the Ken & Mary model, or Kenmeri as it’s usually referred to in Japan. This generation of the Skyline was pretty long-lived, released in 1972 and updated through until 1978 when the C210 ‘Japan’ model made its debut. What does it for me is the proper coupé silhouette dotted with details borrowed from ’70s American muscle cars. 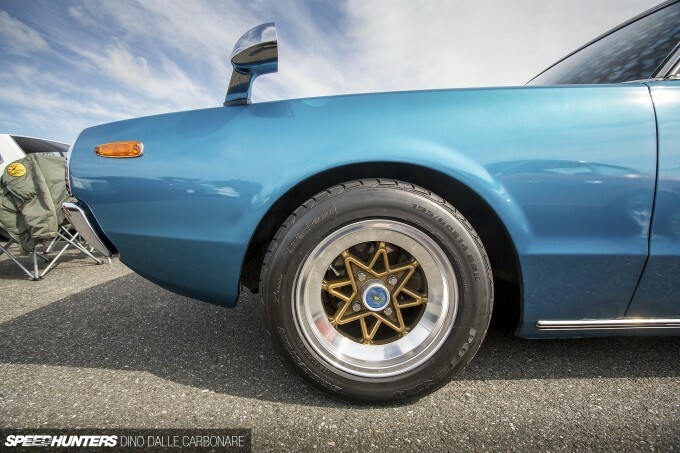 Plus, when I come across one this clean, lowered on a set of vintage JDM wheels like these super-cool 14-inch Techno Racing numbers, well… I lose it. Seriously, just look at that rear end! 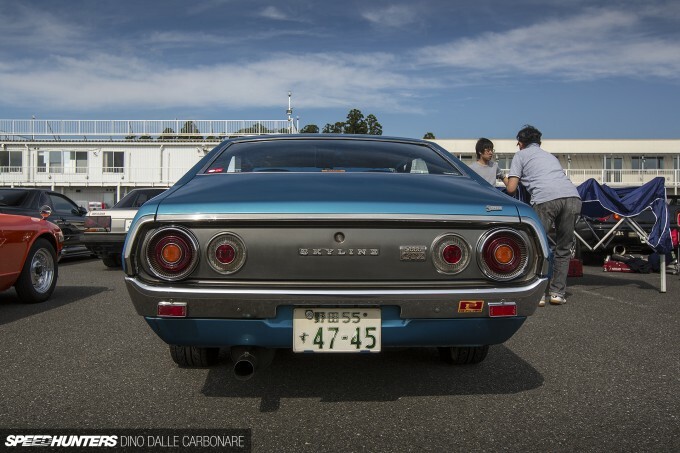 Of course, the Kenmeri was the first Skyline to sport the iconic round ‘afterburner’ taillights that are now an instant calling card for the daddy of them all, the GT-R.
One styling aspect of the C110 I’ve always really liked is the pronounced swage line that forms and extends over the rear wheel arch. It’s something that Nissan sort of carried over into the C210, but it just never looked quite as good on that boxier shape. This particular 2000 GT-X that I came across at the recent Nissan Matsuri has been very well cared and restored over the years. 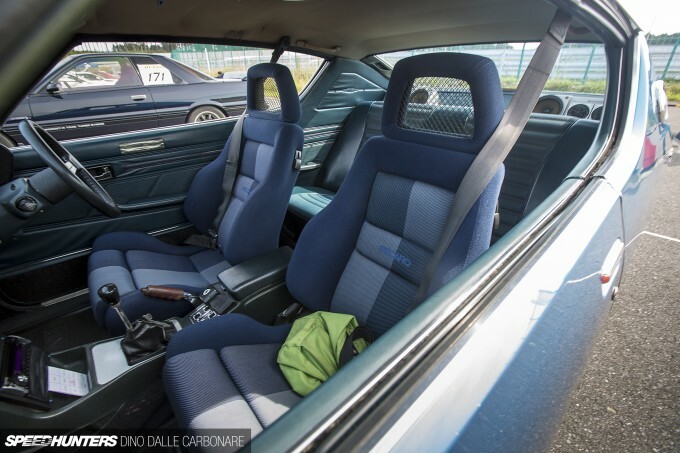 The interior features the somewhat rare light blue trim option and the owner has dumped the stock seats for a pair of ’80s Recaros. At the business end, the stock L20 motor is long gone. 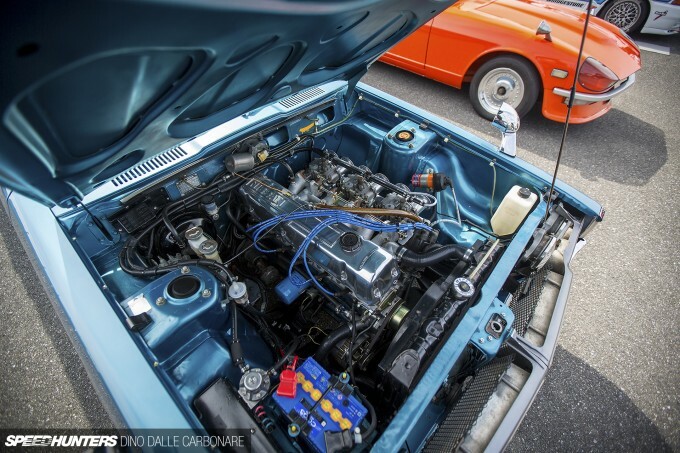 As is often the case with many Nissans of this vintage, a bigger capacity and massively tuneable L28 has been swapped in. 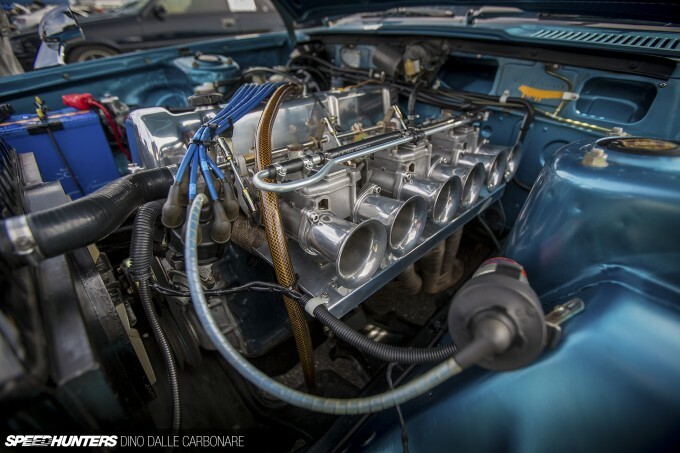 Throw in some decently sized carburetors and a lumpy cam and it will reward you with decent power and a strong mid-range, plus it sounds awesome singing through an open exhaust as this 110 did. 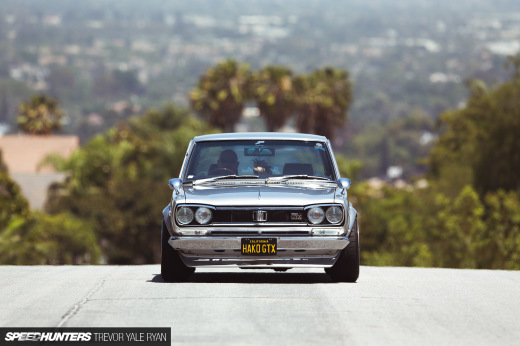 If it’s the Hakosuka that does it for you – great. For me, it will always be the Kenmeri that I’d take home! Kenmeri and z cars do it for me every time. Great feature dino! Genki!!! The C pillar line and the front end does it for me...plus the rear dimples. I can see 71' cuda grill but 71' charger from the rear. Will there be a sweet shakotan style next?? I'm not saying they look anything alike but the design cues are there. I'm really hoping to see one of these for the first time ever next weekend at the Classic Endurance at Tsukuba Circuit, when I visit Japan again. I too would have one of these over a Hakosuka. 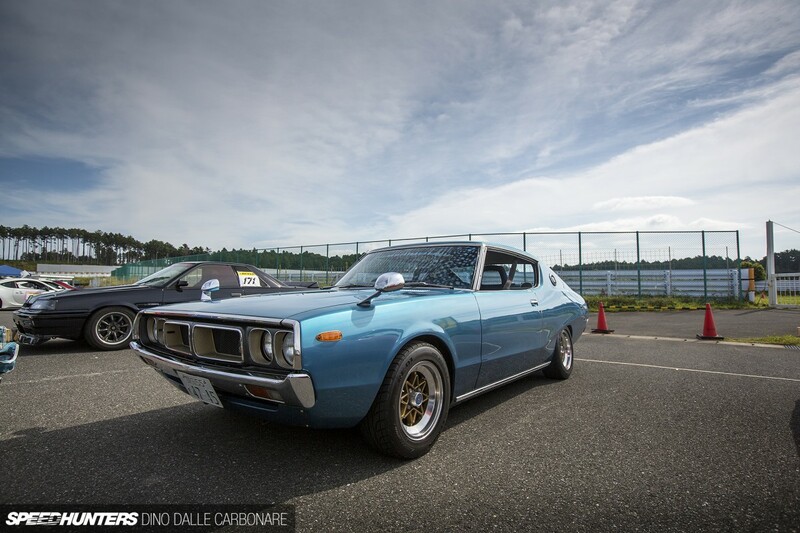 If I could afford one I would have bought one but I bought a '76 RA28 Celica instead, there are lots of similarities. The Dash is very similar to my car! An oil filter on the side for easy oil changes. I love it. 3rd and 4th gen Skylines are very rare in New Zealand, I don't think there were any shipped from Japan to where I'm from. I've only seen pictures on facebook groups of very rusted shells which looked to be C210s - regarded as "ugly". Lol. 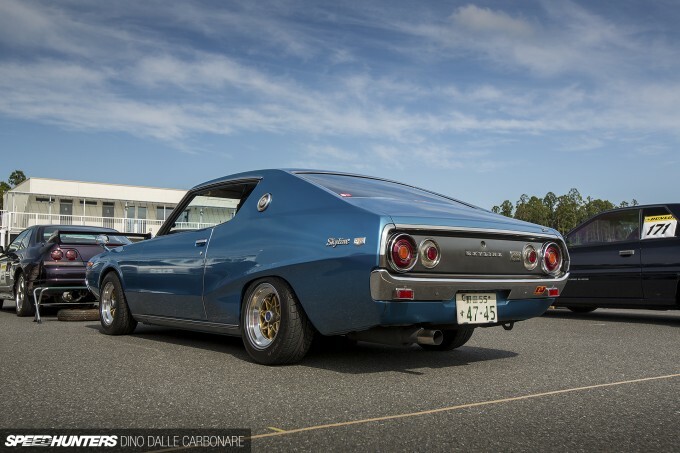 I would definitely get a Hakosuka/Kenmeri if I could afford it, but there's too much scene tax involved. A more realistic option for me would be a RA28 Celica (my favourite totally badass), Mitsubishi Colt Galant or even a Datsun 510(?). I would drive round and fantasise over Hakosukas/Kenmeris/Z cars. Nice to see an uncut example, and a pristine one no less! Kinda funny, my two favorite cars are a '71 GTX and a '72 Kenmeri. Now that you pointed out the similarities, I can see why I can't choose between the two! John Key NZ There are definitely a handful of C210's doing the rounds, a fair few C110's floating about - including a very very cool Japanese inspired build happening presently. Dill Pickle Agreed. When Dino first sent this story in, I was thinking to myself "what's wrong with this Kenmeri, something's off..." Turns out I'm just so used to seeing them with flares. SnoozinRichy John Key NZ I wouldn't say an RA28 is more realistic, probably just about as rare in NZ! 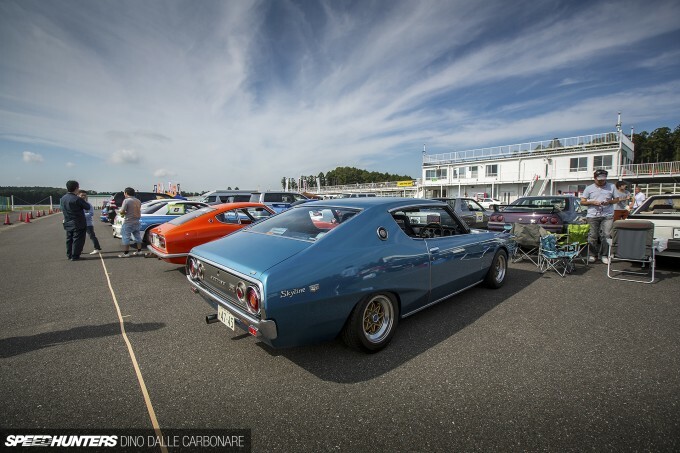 One thing that I absolutely love about classic Japanese cars of the 60's and 70's is that - what I have personally observed - is that they took the American muscle movement and "improved" on it for their needs, like they seem to do with every era. Now, the only thing that always seemed to bother me is the much smaller wheel wells in the back, resulting in the appearance of a bloated quarterpanel. Maybe it is that affinity of muscle rake and monster drag treads that I assimilate with the time, but seeing tiny shoes out back just doesn't make sense to me. I always feel that would be my first order of business if I had my hands on one of these is cutting the back out to add some proportions to the mix, even if that means digging into the swage lines. That aside, this is definitely one of my favorite Skylines. It does embody the combination of American muscular angles with a Japanese emphasis on weight and handling for me. This one is such a clean example, great spotlight!